That was one heck of a first game. "Everything felt solid. Mentally, I felt great, body feels good," Hill said. "Something that I've emphasized throughout the entire season in Oakland and carried over here into L.A. is just stay within the moment, a pitch-to-pitch approach and really just making sure you execute each pitch." Overall, Hill threw six shutout innings by weaving in a loopy and deceptive curve with a fastball that caught most batters by surprise to best the Giants, 1-0. He struck out only three hitter but walked none on 81 total pitches. As for the offense, that came on a solo shot by Justin Turner in the fourth inning off of Johnny Cueto. "It's a cat-and-mouse game every time. He's one of my favorite guys to face. I know how competitive he is. I was with him with the Reds. You're always guessing whether he'll go quick or slow or with the hesitation. Every time we face each other, he does something to make me laugh and he laughs back at me. I always look forward to it." This Day in Dodgers History: In 1964 Sandy Koufax recorded his 50th career victory. He beat the Reds, 7-2. In 2012 the Dodgers completed a blockbuster trade with the Red Sox to get Adrian Gonzalez, Josh Beckett, Carl Crawford and Nick Punto. Via Noel Murray at AV Club; "What makes a sports announcer great? Vin Scully’s season-long farewell marks the end of an era, but all is not lost for 21st-century sports broadcasting." When Scully signs off for good, it’ll be the end of an era. Next summer will arrive without his familiar honeyed voice, telling stories about Greek mythology or American history between putouts and base knocks. For decades now, Scully’s been having a friendly conversation with his audience, keeping them updated on the action while sharing fascinating facts about the players and the world at large. There’s never been anyone quite like him. He turns even the dullest game into a three-hour oasis of civility. But just because Scully’s irreplaceable doesn’t mean that sports announcing as an art-form will be done when he retires. 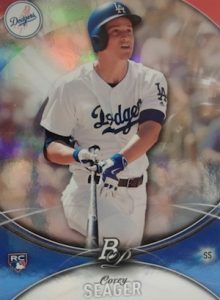 After a one year hiatus Topps is bringing back their Bowman Platinum brand, and it will be a Walmart exclusive offering this season. It is officially slated to be released this week (you should be able to find them in stores right now) and features cards on reflective foil stock. Check out Corey Seager base card on the right to see its design. Via Ken Gurnick at MLB.com; "Jansen breaks another Dodgers record: Closer passes Jim Brewer for career K's by a reliever." Via Ryan Walton at True Blue LA; "Johnny Cueto tries to pull a Happy Gilmore, comes up empty." There is a video embedded for you to enjoy. Via Matthew Moreno at Dodger Blue; "Hyun-Jin Ryu Hopeful To Return In 2016." “He’s about ready to pick up a baseball. 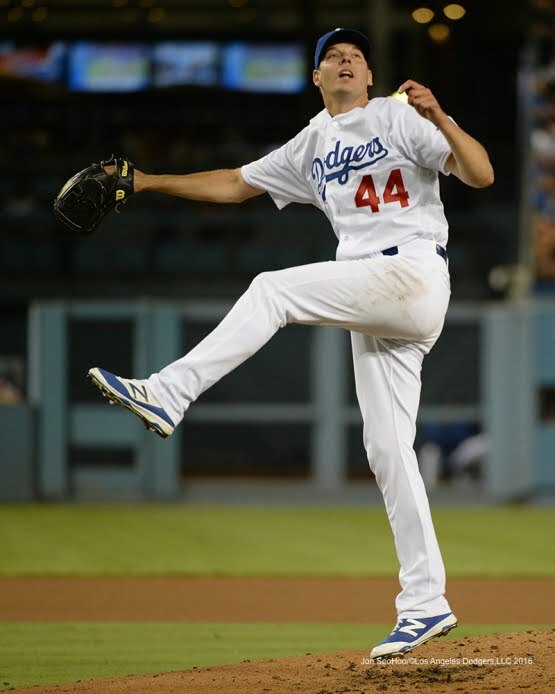 Obviously, we don’t know how much we can build him up,” (Dave) Roberts said. Via JP Hoornstra at Inside the Dodgers; "MLB, MLBPA’s $5 million pledge to Puerto Rico hits home for Kiké Hernandez." Via Mike Lindskog at MiLB.com; "Quakes with 5 All-Stars, Sborz is Pitcher of the Year." Sborz, now a member of the Double-A Tulsa Drillers since being promoted the first week of August, left the Cal League with the top ERA and still owns the top spot, with an ERA of 2.66. Sborz fanned 108 hitters over 108.1 innings, while walking just 30 batters, finishing with an 8-4 mark over 20 games (19 starts).